One of the most original Broadway composers to emerge in the past 25 years, Stephen Sondheim stands today as a reformer who has rewritten the codes by which the musical theater, past, present and future, will be judged. Although he has often stated that he is not trying to change the Broadway musical and that he only works on ideas that inspire him, all his shows bear the unmistakable mark of his unique talent and have compelled many other composers of his generation to follow in his footsteps. What particularly singularizes his shows are the songs, many of which rely on complex rhyme patterns, puns, anagrams, mind-twisters and painstakingly precise wording and which seldom if ever function outside the context of the vehicles for which they were created. This explains why none, with the exception of “Send in the Clowns,” has become a popular hit. The son of a well-known dress manufacturer, Sondheim was born on March 22, 1930, in New York City. At the age of seven, he began piano lessons. But when he was ten, his parents divorced and his mother, a fashion designer, relocated to a farm in Pennsylvania, next door to an old family friend, Oscar Hammerstein II. Then Sondheim collaborated with Richard Rodgers and Arthur Laurents on Do I Hear a Waltz? (1965) which ultimately proved a financial and artistic disappointment. Though he seemed to take a leave of absence from his theatrical activities after that, he contributed the song “The Boy from …” (a delightful spoof of the hit “The Girl From Ipanema” to the Off-Broadway revue The Mad Show (1966). In 1970 Sondheim came back to Broadway with a vengeance. Company, in which he teamed with producer-director Harold Prince, was a clinical study of contemporary urban, upper-middle-class people and dissected their personal relationships with “lacerating honesty.” The show jolted the theater’s creative community as no other musical had done in recent years. Company charted new territories and boldly moved away from the syrupy conventions of the musical theater. It also perfectly integrated the book, music and direction into a seamless, cohesive whole, without sacrificing any one element in its make-up. As a result, the musical theater emerged totally rejuvenated. The legacy of Company can be traced all the way to William Finn’s Falsettos and to the works of Rupert Holmes and Brian Gari, among others who owe a major debt to Sondheim. In subsequent efforts, many of them created with Hal Prince, Sondheim further expanded his horizons, matching the inventiveness of his concepts with his uncanny ability never to tread twice over the same formula. Thus, Follies (1971) revealed the sour reality in the lives of former showgirls reunited in the theater that had once been the scene of their youthful dreams, using as a counterpoint the sparkle and false glitter of the Ziegfeld-like revues in which they had starred; A Little Night Music (1973) ventured into an elegant turn-of-the-century romance based on Ingmar Bergman’s frothy comedy of manners Smiles of a Summer Night; Sweeney Todd (1979) was a Grand Guignol entertainment about a murderous barber, with its score matching in intensity the harshness of this gory tale of mayhem and revenge in 1880’s London; Pacific Overtures (1976) freely adapted the style of the Japanese Noh theater to describe that country’s introduction to Western civilization; Merrily We Roll Along (1981) told its story about the rise and increasing isolation of a successful songwriter, using an unusual flashback technique; Sunday in the Park with George (1984) employed a musical pointillism, well in keeping with its subject matter about Seurat and the birth of modern painting; and Into the Woods (1989), Sondheim’s last effort seen on Broadway at this writing, twisted some familiar Grimm fairy tales to arrive at unsuspected conclusions. “I enjoy writing about neurotic people, troubled people, people with conflicts,” Sondheim once stated. “I don’t like to write about oversimplified people unless it’s for something like a farce, like Forum. Songs can’t develop uncomplicated characters and unconflicted people.” This songbook clearly exemplifies the point. 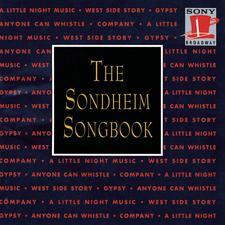 Beginning with Anyone Can Whistle, the Sondheim songs appeared as unsettling question marks about the vagaries of life, its quirky turns and its perceived unfairness. Selected for their lyrical and musical content as much as for what they may say about their creator and his enriching view on life, the songs present only a few facets of an incredible talent, whose influence on Broadway and the musical theater is far from being over.